Item looks great!!!! Very fast shipping!!! Thank you!!! The seller was very good in delivering a good product that worked as described . Thank you for a easy and pleasant transaction, A++++ Seller!!! FAST SHIPPING!! Got these yesterday, 11 April, 19...I think these will work well. Thanks! I don't know guess it got lost in the indinapolis post office. Nice Items, but extremely slow shipping! I have not recieved the cables??? If you mind waiting for 3 weeks, before item arrives, then seller not for you. Items took 2 weeks to arrive as supposed to 1 week when ordered. The cables are easy to install and work just as you would expect them to work, I just received them today and hooked them up right away as they were replacing to older non-working cables. What you get for the price is a wonderful deal, and as of right now there is no reason not to buy these cables. I am actually thinking about buying 1 or 2 more orders of these cables just to have back ups, you really can't beat the price. With just receiving these today, I can't comment on the longevity of the product only time will tell and I will edit my post in a few months with an update on if they are still working and still giving a great picture as they do right now being brand new. Good components on a budget. Lightweight cables like these lack the shielding for a perfectly crisp picture. They do work fine for a 4K TV used as a desktop computer monitor, but there will be slight distortions and ghost images like extra very faint lines in Excel grid lines. For video, any faint image drift will be very hard to notice, and sound quality seems fine. 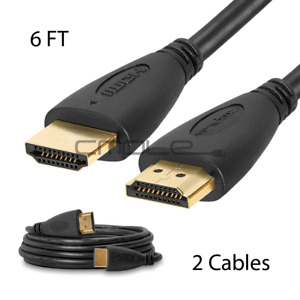 Just know that for three dollars per cable you are not getting a "PREMIUM" quality HDMI cable. It's a very good deal!! It's good to have an extra HDMI cable because you need to use it to hook up your TV to your different components. Works great and was just the right length needed to do the job. I will order more but longer ones for my other devices.